As several enthusiasts have said on these pages, the Bedford OB was a very special model and has a place in many a bus spotters heart. I took this picture of an early version operated by Vics Tours of St. Marys Isles of Scilly whilst my parents and I were on a day trip from St. Ives Cornwall. It was a boiling hot day with temperatures up in the 90’s on Wednesday 29th June 1966 and I can even tell you it was 1.20pm! You will see that it is unregistered, was not taxed and did not have insurance as confirmed by the driver but he explained that as it never got above 20mph, it didn’t need any! It was a fine example of the famous gearbox whine and may well have had a busy life before going to the Islands. It boiled whenever we stopped and the wet patch under the radiator shows the last top up! Also it had a 1920’s Klaxon horn used vigorously at all junctions..this stop was called "Motorway Services"! 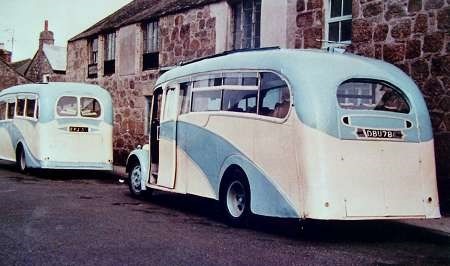 I have no details of any previous owners but would guess it to have been a very early build and maybe even a 1939 version with a body rather different from the Duple normally fitted. The day was one of the best we ever had! It was a day trip operated by Steven’s Coaches of St. Ives harbour from their garage which was later destroyed by fire when a nearby shop caught alight. Our coach (SB?) took us to Penzance and we sailed on the Scillionian I, arrived in St. Mary’s, had our Vic’s Tour ride around the island, then a boat trip to Tresco. We left at 8am and got back about 8.30pm and all for 29/6d each! Two other elements of the day were hearing the Mamas and Papas singing "Monday, Monday" which was a big hit at the time and also the gentle, fruity aroma of one of the passenger’s pipe as he puffed it at times during the day…imagine that now! As regards the Bedford, I have tried to see if it survived but fear it did not. An Austin coach from Vic’s fleet is or was preserved at Manchester Bus Museum but I think it may now be in Scotland. Sadly, the OB may have been pushed over a cliff when it reached the end of it’s useful life because the driver told us that was what happened to anything old so if any restorers fancy a dive beneath the cliff to the left hand side of the beach behind Hugh Town they may find an engine block to start the rebuild with! Over to you experts who maybe be able to fill in details and just possibly even the whereabouts if it escaped the watery depths! Are we sure that this is an OB? Some late model WTBs had the same radiator grille. It’s hard to tell from this angle, but it looks a little too short for an OB. I’m also perplexed about the lack of registration etc. As far as I’m aware the Isles of Scilly are part of Cornwall and obey the same laws as the rest of the UK (ie The 1930 Road Traffic Act!) Am I missing something? I think it looks as if this bus as an exposed radiator cap the WTB with the Bullnose grill had a concealed cap and the OWB and OB had an exposed radiator cap from ‘The Bedford OB and OWB’ book by J Woodhams. Mind you it does look to only have four windows plus the two driver windows which could make it a little on the short side. There is something about the headlamp mountings that help distinguish the model, so that’s my bedtime reading sorted for tonight. This photo pre-dates 1971 when the Scilly Isles were first drawn into the UK’s vehicle excise duty requirements. Prior to that the display of a registration plate was not compulsory and the costs of the roads on St Mary’s were charged to the rates. Neville and Paul..On that day, we saw several vehicles also without registration plates and I recall my father asking and being told that there were so few cars on the Islands that they didn’t worry. On the other hand, I saw that someone had imported a 1965 Ford Zodiac which did display DCV ?? ?C ‘plate so maybe that was the start of formal registration? Spencer..I just wish that I had more pictures to show you but that is the only one. I can tell you that it was indeed rather shorter than any OB/Duple and so I’m in the hands of the experts here. I would guess it to be no more than a 22 seat configuration. The front entrance was by a narrow sliding door and the seating was in a dark autumn leaf pattern, brown leather on the top, chrome aisle side handles. Oh if only I could go back and take more images and get the full details…that’s the trouble when young, you never think ahead! Richard, could the Bedford actually have a lorry chassis? MacBraynes operated quite a few service buses in the Scottish highlands that looked like OBs, but were in fact based on OL (OLAZ) lorry chassis. They were shorter in length than the OB, and many I believe had mail and luggage compartments accessed from a pair of doors at the rear. Passengers boarded in the usual manner towards the front. The melodious mechanical tones would have been the same for OB and OL too. Just a thought…..
Brendan I think you could be onto something there. I have on looking back and at the pictures always wondered if it was a lorry chassis because the length was "wrong" for any normal OB. As regards the rear doors..again I’m going totally from memory but I think it might well have had a door or doors for luggage. Now I have just discovered this website which shows plenty of pictures of the MacBrayne Bedfords and the length looks right but the windows and doors do not match up..but..was the Vic’s bus an early version? Thinking about it, the short length would be perfect for Island use and clearly a good choice for "Vic’s". Have a look through the massive picture file on that website (there are lovely images!) and compare the two bodies. The link is not conclusive but very interesting! Road Tax was not introduced in Scilly until April 1st 1971. Prior to that, no number plates were needed, only the log book as identification for insurance purposes. Richard, thank you so much for pointing out the MacBraynes website. They are indeed lovely images. Unfortunately my family never ventured as far north as the Scottish highlands when I was young, so that beautiful livery in such settings is left very much to the imagination. It always seemed to fit perfectly with the breath taking scenery of the highlands, and MacBraynes was such an important part of highland life, transporting as it did local folk, tourists, parcels, mail and luggage in an efficient and friendly manner, from what I have read. Why politicians have to meddle quite so much with things that work so well beggars belief, but such co-ordination between bus, ferry, train and the Royal Mail was amazing given the geography of the region. Sadly such co-operation is no longer allowed in todays world of competition for competition’s sake, regardless of how inefficient it all now seems to be to many of us! It is pleasing to note however, that the spirit of ‘MacBraynes for the Highlands’ still lives on in those magnificently preserved vehicles. The ‘Passenger Chassis’ differed from the ‘Goods Chassis’ in that the differential was offset from the centre of the axel to the nearside by 11 inch to allow for a lower central gangway. This meant that the engine was at an angle and not straight on the centre line as the ‘Goods Chassis’ . This resulted in a slightly different radiator grill for the ‘Passenger Chassis’ than the ‘Goods Chassis’ . 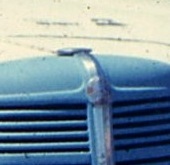 The ‘Goods Chassis’ had a small circular aperture in the centre of the grill for the starting handle but the ‘Passenger Chassis’ had a small access door to the left of the centre. 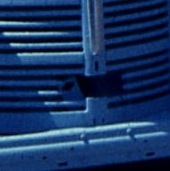 A closeup of Vics bus shows the aperture for the starting handle to be off centre it must of also lost it’s little door. So this must of been a ‘Passenger Chassis’. Spencer thank you for the information and indeed you are correct regarding the grille aperture. As the Caledonia MacBrayne Bedfords were known to be lorry specification chassis,. The picture of Vic’s bus is actually cropped slightly and a little dark but looking at the original, you can see the top of the steering wheel and a single, vertical spoke but that doesn’t really help re the number of spokes. It does look to be a simple plain bar and not a sprung version. So..it’s a short wheelbase or short bodied passenger chassis Bedford but it is keeping it’s history hidden! I notice that the firm appeared in Little Red Books regularly. I’ve copies for 1956/7 and 1970/1 which list the fleet by chassis and bodymaker. These don’t solve the query for this particular vehicle – but anyone with a 1966 edition might be able to shed some new light. I’ve got the 1967 edition of the "LRB" and Vic’s Tours appears not to be listed at all unless concealed by a surname. The only two operators listed for the islands in that edition are PC Trenwith and RC Perry of St Marys, operating six vehicles (3 Bedford and 2 Austin bodied by Duple, Heaver, "Sanctus", and two by Whitson, plus an all-Commer minibus) and Williams Bus Service, also of St Marys, with 1 Dennis and 1 Bedford (no bodywork details given). It is worth noting, however, that the "LRB" was notoriously inaccurate. It frequently omitted very well-known operators and in the case of others gave fleet details that were up to a decade out of date. If the operator didn’t update their own listing nobody at Passenger Transport made any effort to do it for them. 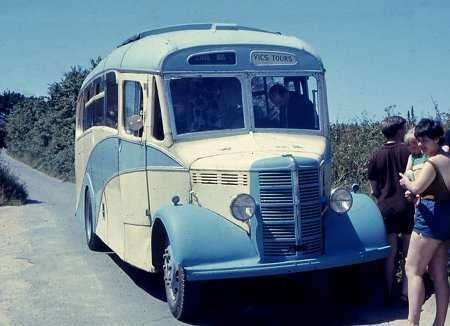 As a teenage bus enthusiast in the 1960s the "LRB" was the cause of many a disappointment. I would travel miles to see rare types of chassis or bodywork only to discover (in most cases) that the vehicles had been disposed of ten years previously and all that remained were Bedfords with Duple Super Vega bodywork. Vics Tours is the P V Trenwith & R C Perry which shows in later Little Red Books. The 1967 and 1970/1 editions differ by one vehicle – a Bedford with Sanctus body – so we’re one step further forward in the identification. An article in Buses Illustrated February 1959 suggests the firm had a pattern of acquisitions from an Exeter dealer, Beale’s and directly from mainland Cornish operators. There can’t have been too many Sanctus bodied Bedfords in Devon or Cornwall pre-1966. This may well have been one of them. Just realised why the quotation marks were shown in Neville’s post. As the Leon thread has mentioned, the bodybuilder is Santus of Wigan. Mike and Neville..Thank you for the further research. I have done some detective work about Santus and found that it was an old coach building firm run by the Santus family who are very well known in Wigan but now as confectionery manufacturers.."Uncle Joe’s Mint Balls" apparently! Thomas Santus is listed as a Director of "Santus’s Motor Body Works Ltd of Greenough St, Wigan. He died on 6th April 1939 and it appears that the Company was taken over or absorbed by Northern Counties and/or Massey Bros. both of Wigan and well known coach and bus body builders. I’m trying to trace any pictures but no luck yet. In one of those odd coincidences, this links with the Santus bodied Lion JP42 on the Leon thread! Fascinating! What we now need is a picture of a Santus bodied vehicle to try to see if the general design features match up in any way. Back to the search button and I’ll see if I get any luck! Well..via information on the "Leon" thread I now have found a Santus bodied Seddon coach which is here at this flicker link I have managed to put both pictures side by side and believe that I can see enough similarities in the design detail to think that the Vic’s Bedford is indeed the Santus bodied coach mentioned in the LRB as above. It is the fall of the side windows, the style of decorative body beading, the panel joints on the roof, the shape of the drivers door handle and the general proportions of the cab pillars that lead me to think that. Richard, Santus didn’t give up coachbuilding until (at the earliest) 1951 – see my comment under the JP 42 thread. Also, according to a recent edition of Classic Bus, there is documentary evidence (birth certificates!) that the coachbuilding Santuses and the mint balls Santuses are not in fact related to each other despite the claims to the contrary by various Santus family members repeating what they’ve been told by their forbears. There were apparently two entirely different "William Santuses" in Wigan, alive at the same time, but entirely unrelated. Having dealt with the slapdash claims of various "family" and "local" historians over the years (with not a history degree between them) I tend to give credence to the birth certificates! Neville.. thank you for correcting this "Santus" information. I obtained mine from a website called WiganWorld where there seems to be a wealth of local information which included the coach building/mint balls link! I did think it seemed an odd career move. It shows how easily "history" can be rewritten with such confusion! Re my above posting and trying to see if the Bedford was Santus bodied, I just wish that I had another picture to help. The picture I sent in has been cropped a little but further to the right is a lady who was on holiday from Manchester and she took some pictures but trying to trace here would be some job! I note that FDL 782 & GDL 25 bore IoW registrations. The second one (Austin K4SL) would have been a rare chassis in the bus world, very rare with its Whitson body! The CXB was a newer version of the primarily wartime K4. Clive..thank you! So it looks near enough certain that "my" Bedford was DBU 78 first registered in Oldham during May 1946. My picture was taken in June 1966 so the poor bus seems to have probably been on it’s final year of service before being scrapped and, if the driver was being serious, was destined to be pushed over the cliff into the sea which he said was the way they dealt with all scrap vehicles. It sounds horrendously incorrect on every level these days but there were very few cars on St. Mary’s then and so the frequency must have been low thank goodness. Sad though because the Bedford had a particularly musical gearbox even for that model. Just for the record, it is still the case that a vehicle operating on any island which has no tunnel, bridge or regular vehicular ferry service to the UK mainland does not require an MoT! I can confirm from the Oldham registration records that DBU 78 did indeed have Santus bodywork and was initially registered to Shearings Tours of Oldham in July 1946. It was on the Isles of Scilly from June 1954 after operating with Coombes of Torquay from August 1947 and Beale of Exeter for a short time in 1954. Phil..thank you so much for at last completing the story of "my" Bedford. An interesting history to read and it appears to have had a 13 year life of service on the tiny island roads so no doubt was getting very tired when I took the picture. I believe it lasted until 1967 but no doubt met it’s breaker very soon after that…or had an rather watery end off that cliff! I vividly recall a trip on the Vic’s Coaches Bedford – August 1964. I can still almost hear that gearbox!! To a 13 year old with a love of all things mechanical it was a wonderful trip. Really sorry I never had my camera (Kodak Brownie 127) with me that day. Correct about old vehicles being pushed over the cliff – a later visit (1975) saw me wandering around amongst numerous engine blocks and bits and pieces – many were the mortal remains of pre-war Austins. It is wonderful to read the above comments about Vics tours, and the fleet list. I was the driver of the bus when the photograph above was taken. I can be seen standing at the back of the group in the larger version of the photo. I drove all the buses in the fleet list and had many hours of fun as a driver and tour guide. It has to be said that the buses were very tired at that time but they very rarely broke down. 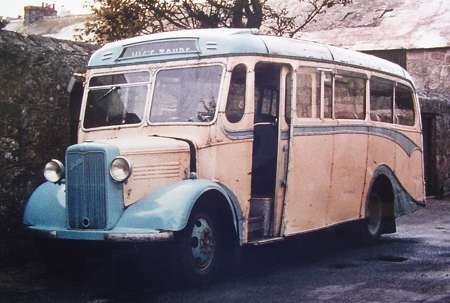 There is an article on the Scilly Isles in Classic Bus 155, which says DBU 78 had a prewar Plaxton body (new coach bodywork being difficult to come by in 1946), though it doesn’t say anything about the body’s previous life. There must be a Santus connection somewhere, and the suggestion is made that perhaps it was Santus who altered and fitted the body for Shearings. If so, the alteration probably included the exterior trim, which looks very 1946 Santus to me. According to the PSVC Bedford OB chassis list book C1252 DBU 78 was new with a Santus C25F body in 7/46. There is no mention of a pre war Plaxton body. John, the author of the CB article is aware that some sources say it was a Santus body, but disagrees, and so do I now. Please ignore what I said about Santus altering the trim – that was just ignorance of what prewar Plaxton bodies looked like, together with the fact that a piece of the original trim seems to have gone missing by the time the above photo was taken. I’ve now compared photos in the article with one of a 1939 WTB in Alan Townsin’s Plaxton book, and there is no doubt that it was a late 1930s Plaxton body. Here is a pic of the rear end of DBU 78, it does appear to look like a Plaxton body, the most likely answer is that it was probably modified and fitted to the OB chassis by Santus for Shearings. It would have required quite a bit of modification as presumably it would have been originally fitted to a WTB chassis which is much different and shorter than the OB. Looking through my collection of OB/WTB photos I came across this one of a Vics Tours Bedford WTB with what looks like a Duple body, again no front number plate so does anyone know its id. Is this the bus that was given to two Enfold teachers, then went to Dunlopillo Rochdale, then to Manchester Transport museum and now in Devon at WHOTT? Donald, no the WTB thats with WHOTT is EFJ 92 with Heaver body.